Several years ago my husband Fluffy was an officer in a software group that met twice a year for a weekly convention. Because software dweebs from all over the U.S. belonged to this organization, the conventions were held all over the country. Most of the time I accompanied him, so we got to visit hotels all over the continent. We visited Orlando, Tampa, New York City, Nashville, Minneapolis, Denver, Seattle, Los Angeles, Long Beach, Phoenix, Washington D.C., San Francisco and other places that I no longer even remember. We even went out of the country once, when we met in Montreal. Because this was a large group (500-1500+ attendees), the meetings were always held in metropolitan areas where there were large hotels equipped to hold convention meetings. This means we always stayed in nice hotel chains, and had great rooms. Even though Fluffy was working, these still became mini-vacations for us, and it was like having an extra two weeks of vacations per year (probably less so for Fluffy, because he spent most of the time in meetings). In addition to these conventions, he also attended several computer-related classes each year where we stayed in nice places. During many years we traveled as much as three months of the year. These were also cheap vacations, because Fluffy's employer picked up most of the costs. We would have to pay for my plane ticket and meals, of course. And sometimes the hotel would charge a few dollars more for an extra person. But one of his employers even picked up my travel costs as an extra perk, because they knew I liked to travel with him. 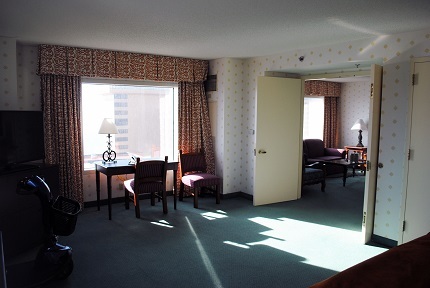 On a couple of occasions, we were even lucky enough to get our hotel room upgraded to one of the executive floors where they had extra perks like appetizers, snacks and bottled drinks. When we went out to eat, we also went to nice places because Fluffy's expense account would at least cover his meals. So for nearly three decades, we felt like we were really living the high life. We could choose hotels and restaurants where money was not a consideration, and feel like we were rich and famous, even though it was just twice a year. When Fluffy retired, we knew that some financial adjustments were in order, and lamented the fact that our days of traveling like Donald Trump were probably behind us. And indeed, most of our post-retirement trips have involved budget hotels and restaurants for which we have coupons. But occasionally the stars align, and we can feel like big shots again. This happened last week, when Fluffy scored us a great hotel up in Atlantic City. The hotels there are offering great prices, because it is off season, and because fewer people are going there. 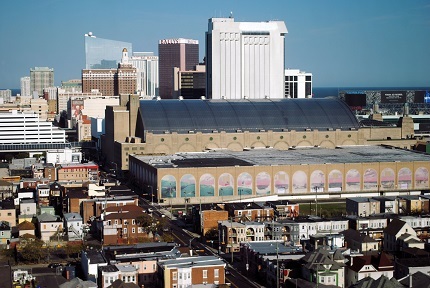 The big draw of Atlantic City has always been, of course, gambling. But because surrounding states have opened their own casinos, one of the big draws of the city is no longer there. So there are lots of big empty hotels that are looking for people to stay there and hopefully visit their casinos, especially during the winter months when it is not vacation season. One secret to get a cheap hotel is to visit the discount travel web sites. This deal we got through TravelZoo (www.travelzoo.com), but we belong to a whole bunch of them. Once you register (for free) you will get lots of emails full of travel bargains. The rate that Fluffy got us was for $65 per night. We still had to pay some extra fees and taxes on top of that, but we also got a $20 credit per day that could be used to cover parking and food in the hotel restaurants. So taking all the fees and credits into account, the bottom line was $64.10 per night. That price is more than our usual budget trip, but not by much. We had also requested a wheelchair-accessible room, so I could use my wheelchair and power scooter in the room. When we checked in, we were told that we had been upgraded to a suite. That was sweet indeed! This is our two-room suite where we could have entertained at least 20 other guests. We were also in a corner room, up on the 52nd floor. On one side we could see the city, and on the other side we could see the ocean. It was a great view, both during the day and after the sun went down. It was a huge room with both a living room and a bedroom. We could have saved the parking fee by parking our car in the living room, with extra room to spare. The sign on the door said the normal room rate was $250-$750 per night. Not a bad deal for $64.10. This was one of the views from our bargain-priced room. Another window overlooked the Atlantic Ocean and the boardwalk. One nice thing about the hotel is that it was right on the boardwalk. In fact, one of the restaurants where we ate overlooked the boardwalk, and we could see people walking and running by, while we were doing our own exercising by visiting the buffet. We visited the boardwalk twice during our stay. This picture was taken near sunset. Our major exploration was the next day, when it was earlier and very sunny and beautiful. Exploring the boardwalk was a lot of fun. It was typical of most beach towns, with shops offering fast food, T-shirts, and cheap souvenirs. There were also lots of big-name hotels, casinos and restaurants. 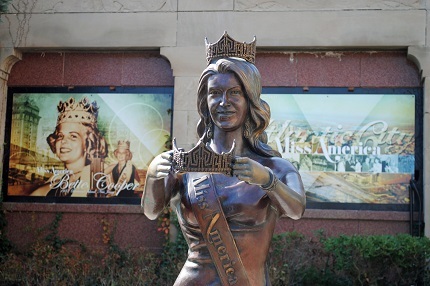 We even found a tribute to the Miss America pageant, which has been held in Atlantic City for more than 20 years. This was a tribute to the Miss America pageant, which calls Atlantic City home. Even though it was a short trip, it was delightful. 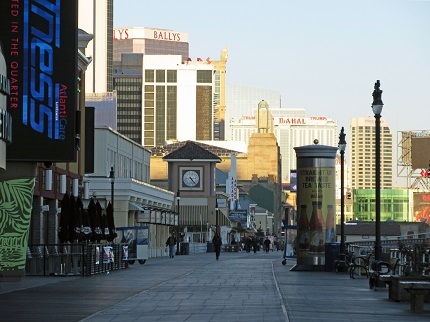 I had never walked on the Atlantic City boardwalk before, and that was great fun (even though technically I used my scooter and not my feet). The weather was beautiful for the entire trip, and we did not feel like we were breaking our budget while having (what felt like) an expensive vacation. 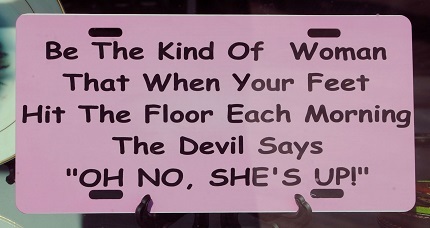 I really liked this sign that was for sale in one of the souvenir shops. I think it applies to many of the great women (and men) that I know. This is a lesson that we all need to remember in life. Sometimes the biggest obstacles to reaching our goals are within our own minds. We can still eat steak on a hamburger budget, but it takes some planning, research, patience, hard work and good luck. If you really want something, make it a matter of thought, planning, and even prayer. Doors will be opened, and miracles will occur. This has been one of the things that I regularly get reminded of, and it happened again last week on a boardwalk in New Jersey.